The reputation of Cafe Hon precedes it. I’ve read good reviews and bad, both by local bloggers and by food critics. Some people like the tacky decorations and the large-haired ladies working the front counter that is the original from the hardware store that used to occupy the space. The word “kitschy” is most used to describe the decor, but to be honest I don’t care for all of the aesthetic one way or another. What I do like is that the kitchen appeared to be sparkling clean stainless and staffed by impeccably dressed chefs and line cooks in white garb. Also — for better or worse — the owner has been credited with the commercialization of the term “Hon”. If you don’t live in or around Baltimore that probably won’t make sense to you, but that’s fine since that doesn’t matter to me either. My concern was with the food, so last night I got the opportunity to join two lovely ladies out for dinner at Cafe Hon. In short, the food was tasty. At first I had some difficulty finding something I wanted. The menu is full of crab meat-laden dishes, which is great if you like crab. 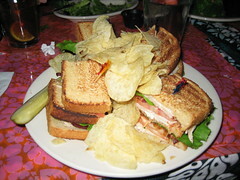 I don’t, so after a few minutes looking the Turkey Club caught my eye. I was a tad skeptical at first since it was $10. That’s more than I’d usually pay for a club sandwich even with chips and a pickle. But when it came out I was overwhelmed by the size of the thing, as if the guy who prepared it thought “I’ll give you a $10 sandwich you skeptical fool!” After a generous layer of potato chips on top, the plate stood about 4 inches tall. The turkey was thick and flavorful, not deli-style turkey sliced. The tomatoes were fresh and sweet. The bacon was crisp and delicious. The pickle was so-so, but aside from that the portion was so large that I had a difficult time finishing the whole platter. Two thumbs up. I didn’t sample the other plates at our tables, but they do bear a mention. 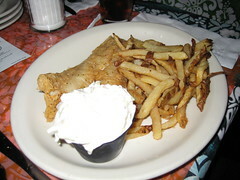 The English Style Fish and Chips ($17) pictured above appeared to be deep fried goodness. The dish was ordered for the coleslaw and it didn’t disappoint, reportedly creamy and delicious. The washed out photo doesn’t do it justice. I don’t eat fish, but it must have been tasty since there were almost no leftovers safe a few French fries. 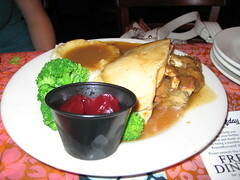 Although it isn’t November or a holiday, the Thanksgiving Turkey Dinner ($13) looked rather tasty as well. Aside from the turkey, it’s served up with stuffing, mashed potatoes and gravy, cranberry sauce, and steamed broccoli. That platter got demolished, too. The restaurant itself wasn’t too busy for a Saturday evening, there were plenty of free tables. I found the service to be quick and pleasant. Refills on iced tea were quick and numerous. While the decor and Hon-based mantra doesn’t do a whole lot for me, I was pleased with my meal and I’d definitely go back and try another dish or two. Cafe Hon subscribes to the Cheesecake Factory school of huge portions at outrageous prices. And it does have a rep as being touristy. I prefer Golden West Cafe down the road on the other side of the street. I had a really good BLT at Cafe Hon not long ago — it’s one of the few things that I really REALLY like from there. They know how to cook bacon — and you’d be surprised how many people have no clue how to cook bacon. yellojkt: Anytime you’ve got cutesy decor you’re going to get that reputation. Golden West has been on my list of places to try for a few months now, just haven’t made it happen. So many choices, so few opportunities to eat out. Carol: I’m one of those people. I manage, but their bacon was superior still.